You can pay via most of credit cards or PayPal checkout system. Simply browse to the item you would like, select the quantity and color, and click "Add to Cart". When you are ready to check out, check on the PayPal check-box on the bottom of the Check-Out page. PayPal is a third party processing service, that allows you to make a payment by using most credit cards, E-check or electronic funds transfer. PayPal is used by millions of online shoppers and retail vendors. It is a very safe payment system. You will have to set up an account with PayPal in order to purchase through these third party payment sources. After placing your order, you will receive a shipment notification and tracking information from Paypal and eHairDepot.com. Shipment notifications will be sent to your e-mail account. PayPal Verified and/or Confirmed: To expedite your order, please be sure your account is verified and address confirmed through PayPal. 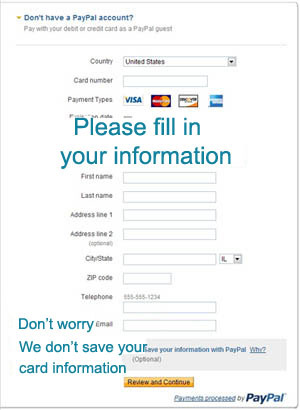 (See instructions within your PayPal account). We reserve the right to require one or both of the security measures mentioned above. Orders placed with accounts that are not verified and confirmed may delay/hold order processing. 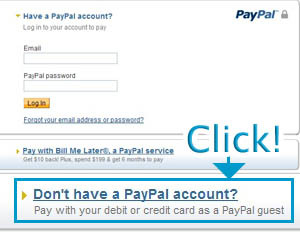 Notice : If you don't have a Paypal account, You can select "Don't have a PayPal account?" button on the bottom.